Her work is usually characterized as a part of what is now known as Naïve art, but has sometimes been described as “surrealist”. This is important, as the founding father of surrealism, André Breton, held Kahlo in high esteem, going as far as describing her art as a “ribbon around a bomb.” She was an active political artist and married fellow communist artist Diego Rivera in 1929. Kahlo was born in Mexico and grew up in what is now known as the Blue House, or Casa Azul. Her father was a German photographer who had immigrated to Mexico. After having contracted polio when she was 6 years old, Kahlos’ right leg and foot were damaged, making her walk with a limp and causing her father to encourage her to play soccer, go swimming and even wrestle in order to help her recovery. All of these were highly unusual activities for a girl to participate in at the time. Kahlo first met her future husband, Diego Rivera, in 1922, when he created a mural at the renowned Mexican National Preparatory School, where she was enrolled at the time. While at school, she became interested in politics and became romantically involved with one like-minded student, Alejandro Gómez Arias. In 1925, she was traveling with Arias on a bus, when the vehicle collided with a car and seriously injured her, by impaling her with a street handrail which went through her hip. She began to paint during her recovery and gave her first self-portrait, which she finished in 1926, to Arias. She became more politically active and joined the Young Communist League and the Mexican Communist Party. She met Diego Rivera again in 1928 and married him the following year. The two moved around a lot based on where Riveras’ commissions were. In 1930, they lived in San Francisco, California, where she showcased her painting, “Frieda and Diego Rivera” for the first time. They then moved on to New York City and, later on, to Denver. 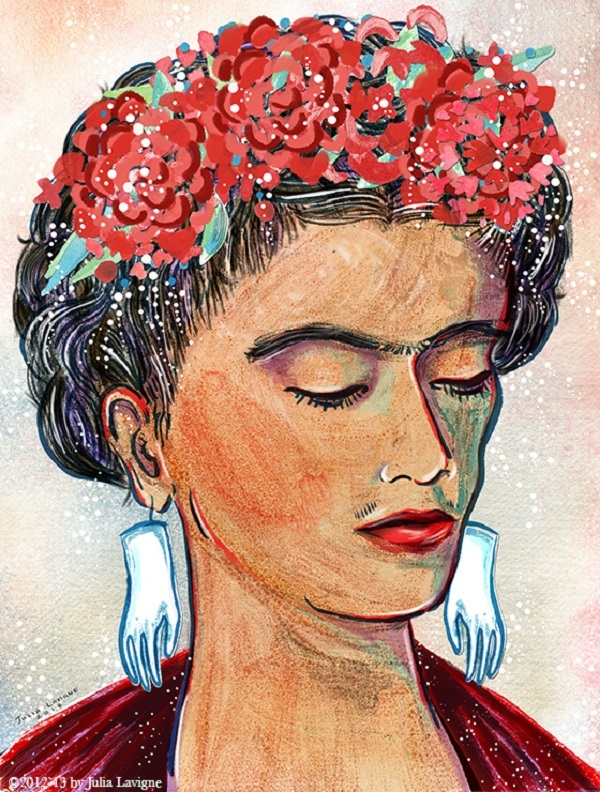 In 1932, Kahlo started to incorporate more graphic and surreal elements in her work. For instance, in her painting, Henry Ford Hospital, a naked self-portrait of hers is surrounded by several items that were connected to her by red, vein-like strings: a fetus, a snail, a pelvis and more. The couples’ time in New York City saw them surrounded by controversy. While working on a mural in the Rockefeller Center, Rivera included a portrait of Lenin (which was later painted over), causing Rockefeller to stop the project in its tracks. Following this, the two moved back to Mexico and went on to live in San Angel, Mexico, where they kept separate but adjoining homes and studios. 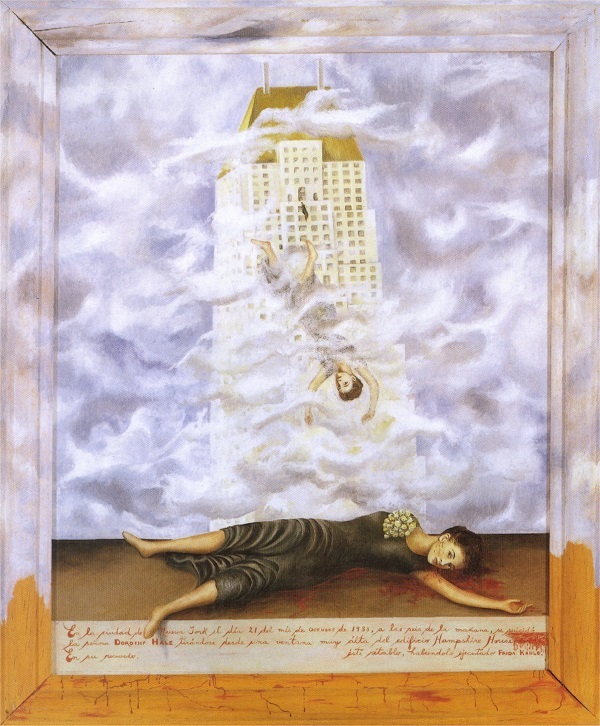 Rivera was far from faithful, and Kahlo found out about his transgressions, including an affair with her sister Cristina. 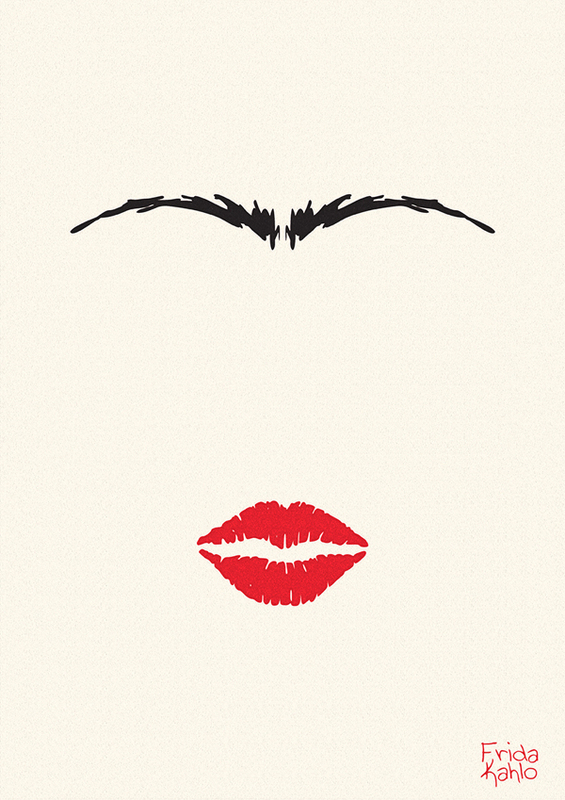 The sadness caused by this made Kahlo cut off her trademark long dark hair. Further heartbreak followed when Kahlo miscarried in 1934. The two went through several subsequent periods of separation but were reunited when they helped exiled Soviet leader Leon Trotsky and his wife Natalia in 1937, by giving them shelter at the Blue House. Reportedly, Kahlo and Trotsky had an affair at the time. 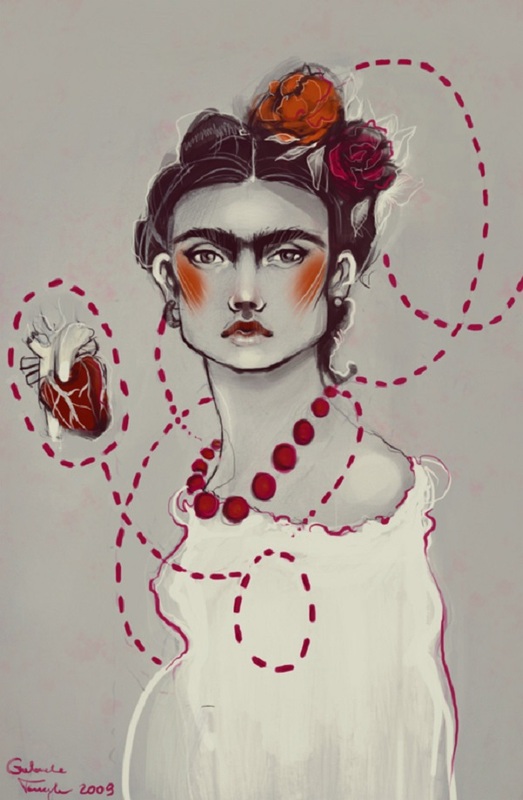 The art of Frida Kahlo is often characterized by its suggestions of pain. During her life, she created at least 140 paintings, 5 of which are self-portraits that include symbolic portrayals of physical and psychological wounds. One of the primary influences on her work was that of Diego Rivera, whose encouragement and recognition of her talent was possibly the key factor in her pursuit of a life as an artist. 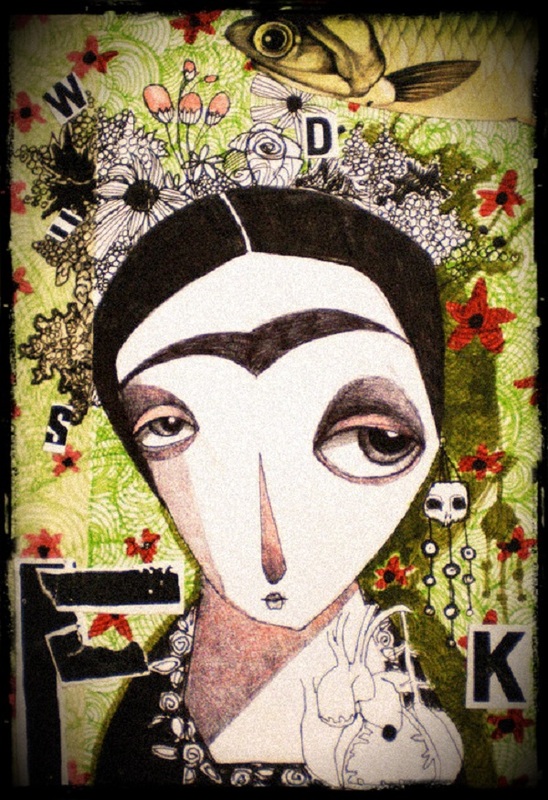 Her art was also heavily influenced by Mexican indigenous art. This is easily visible in her use of bright colors, dramatic symbolism and primitive style. Her artwork frequently included Christian and Jewish themes, combining traditional Mexican religion with surrealistic elements. 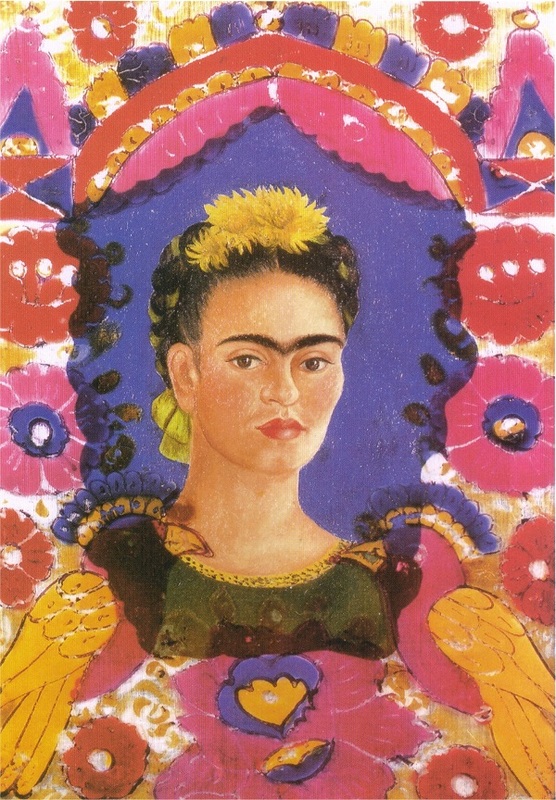 Aside from a 1939 acquisition of her painting The Frame by the Louvre, Kahlo was not critically acclaimed during her life. For decades even after her death, she was mostly remembered as Riveras’ wife. She only became widely known at the end of the 1970s and early 1980s when the Mexican Neomarxismo artistic style began. 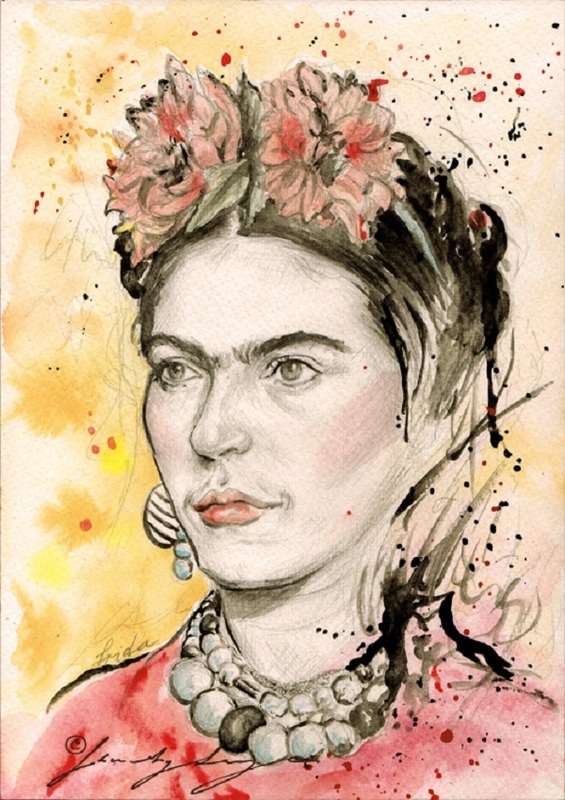 Over the years, Kahlo has inspired a lot of art, in various mediums, from the visual arts to music. 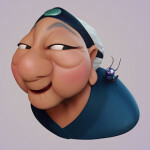 She is now recognized as one of the most influential Mexican artists of all time. 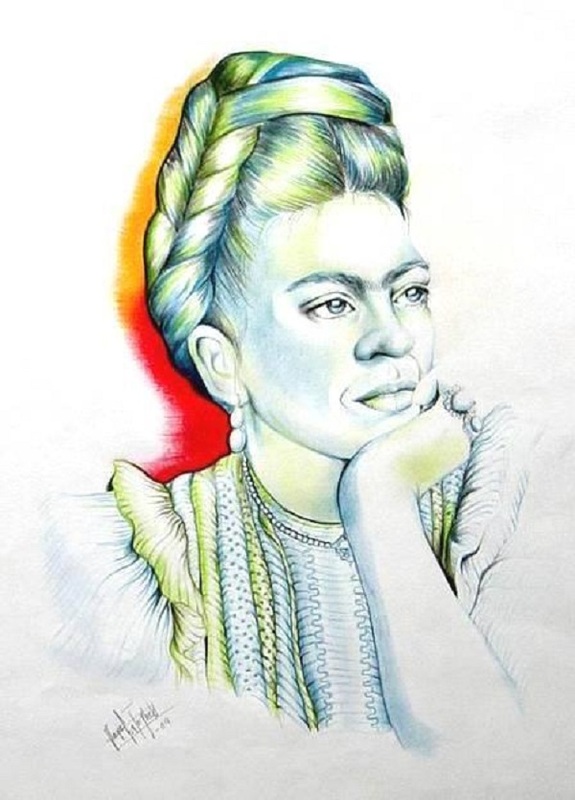 In 2001 she became the first Hispanic woman to be honored with a U.S. postage stamp and, since 2010, she is featured alongside Diego Rivera on Mexican currency, more specifically on the 500 peso note. She has been the inspiration for a biographical film titled Frida, where she was played by Salma Hayek, as well as several books and plays. 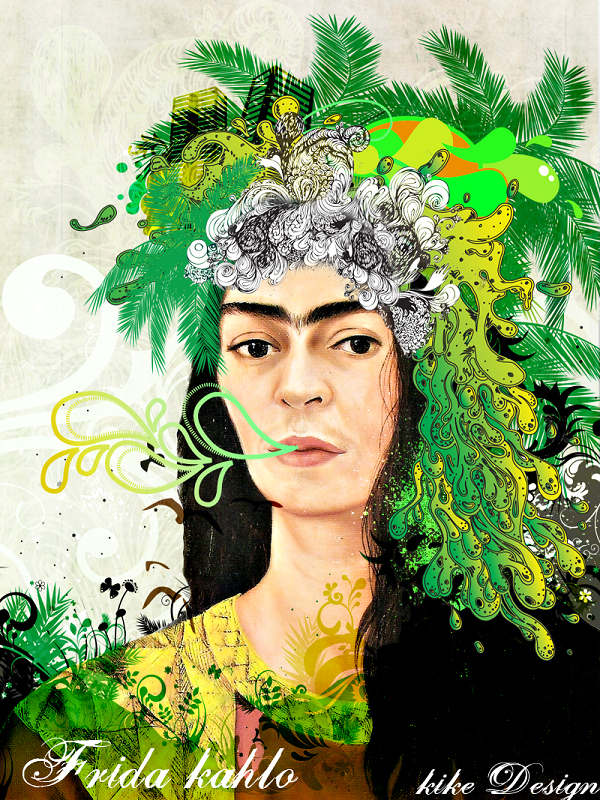 Many graphic designers and contemporary visual artists have been influenced by Frida Kahlo and her work. Some of the elements that they have taken from her are the vibrant colors, the flowers in her hair, her trademark eyebrows, the way she cluttered various elements in her paintings, the underlying feelings of tragedy and passion. 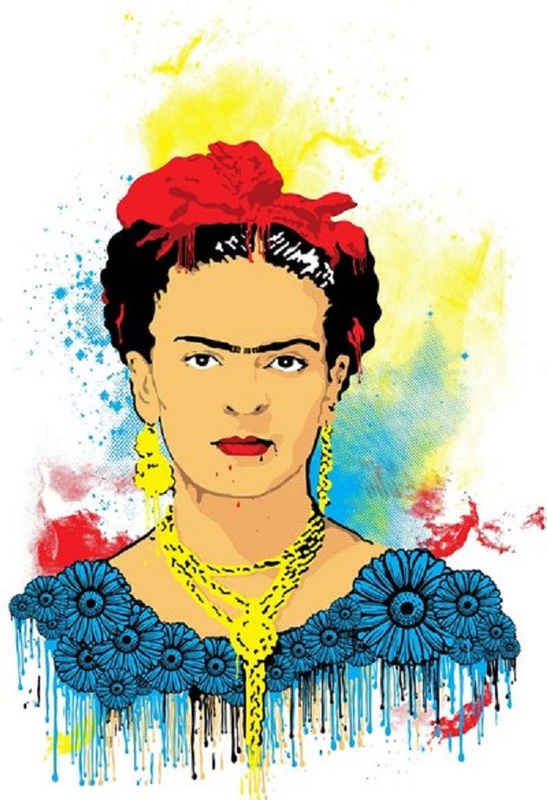 What follows is a short selection of our favorite artworks inspired by Frida Kahlo, her life, and her work. This pretty much wraps up our look into the fascinating life and work of Frida Kahlo and the influence she has had on modern graphic design and the arts in general. We have featured our favorite paintings earlier on in this article. What are yours? 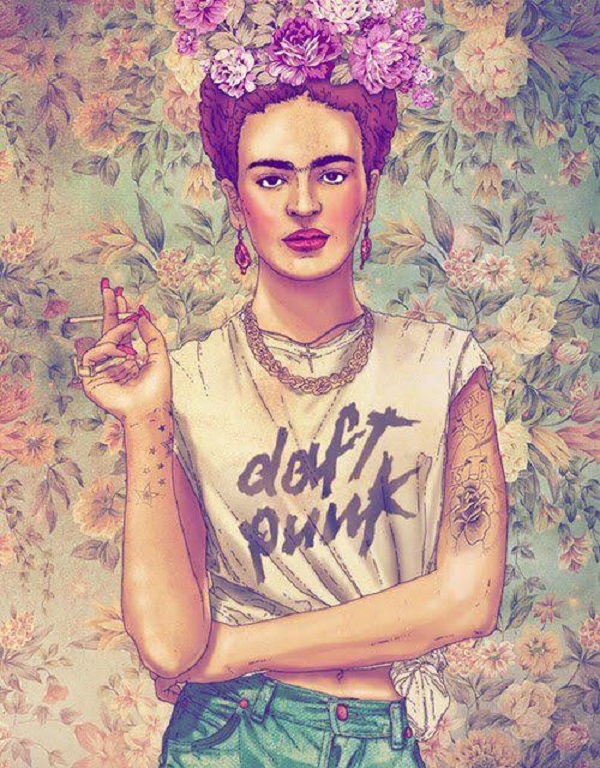 Also, what are your favorite pieces of art inspired by Frida Kahlo? 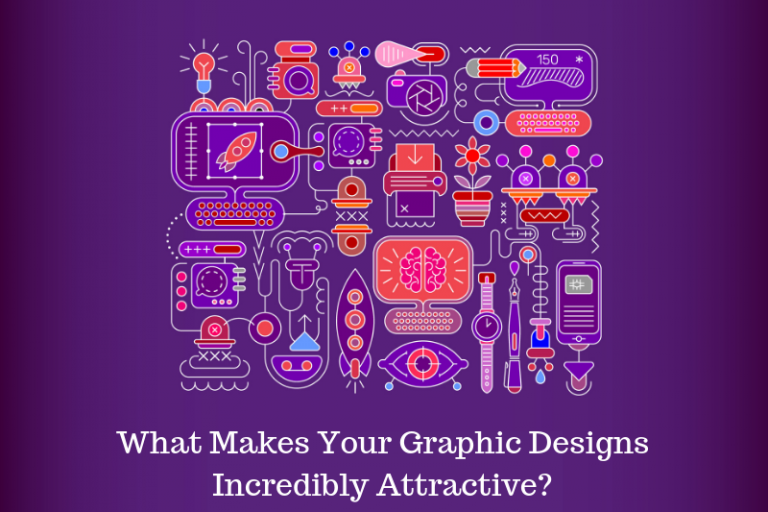 Don’t hesitate to let us know in the comments section below! Thank you for the information, Marcela. 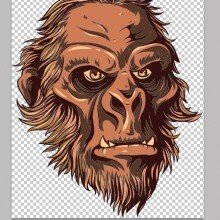 The article has been updated with the correct name of the artist. 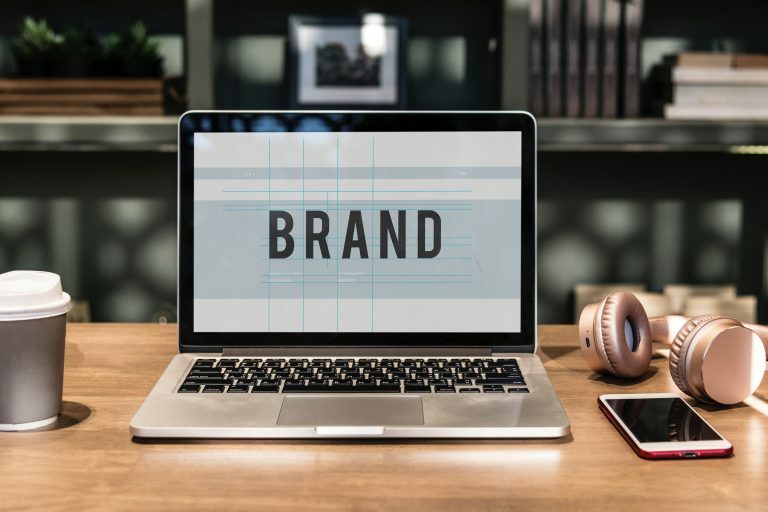 Very cool article! 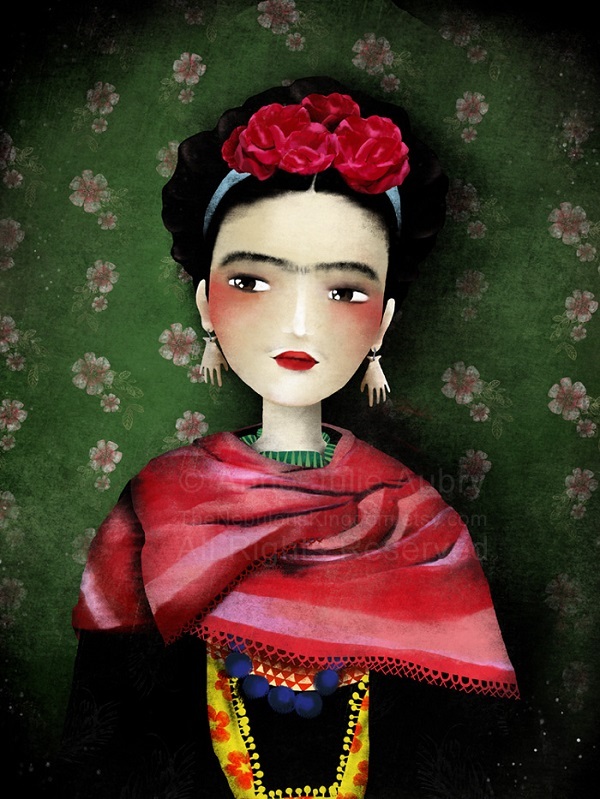 I love Frida Kahlo’s work! Her life was so intriguing, yet, riddled with sadness. I will pay for the picture.